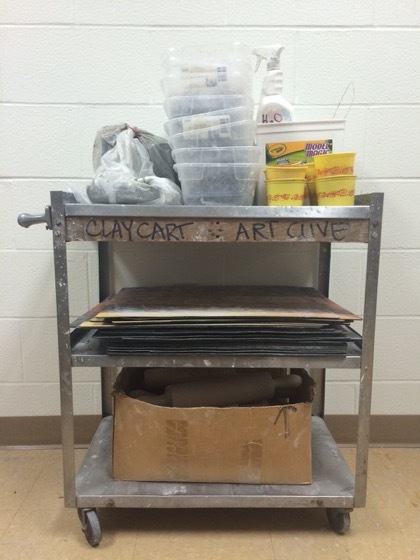 Let’s face it — as art teachers we have a lot of STUFF. 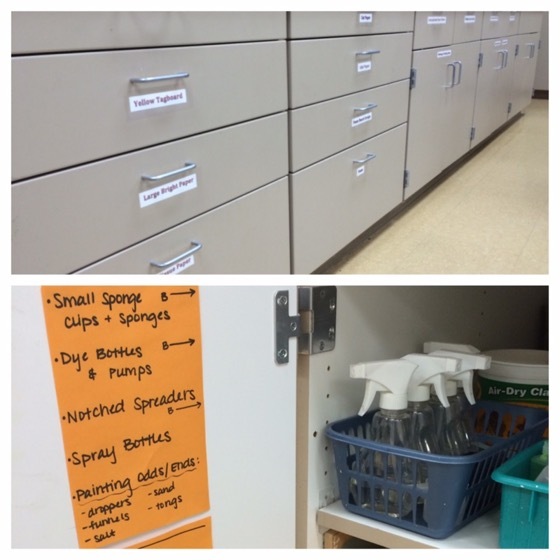 The key is to organize our glorious abundance of materials in accessible and efficient ways. 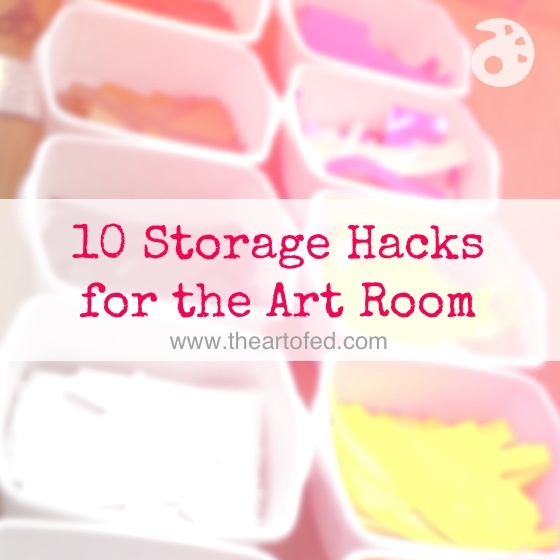 Below are some of my favorite storage hacks for the art room. 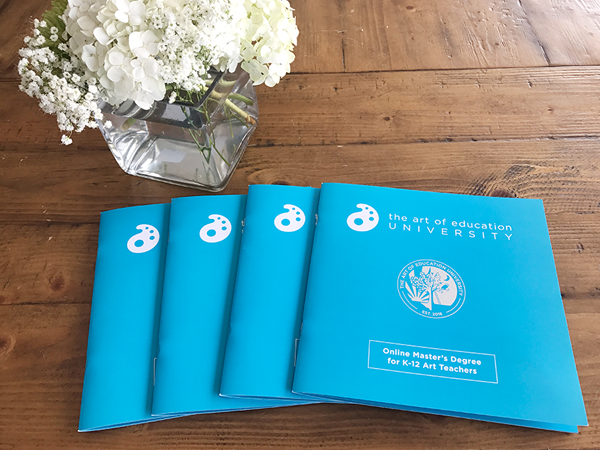 The best part about most of these is that they are student-friendly too! 1. Store “like” objects together. 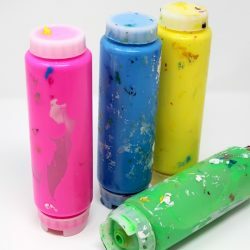 Like my cart article suggests, keep similar materials and supplies together to avoid running around your room to gather them. 2. 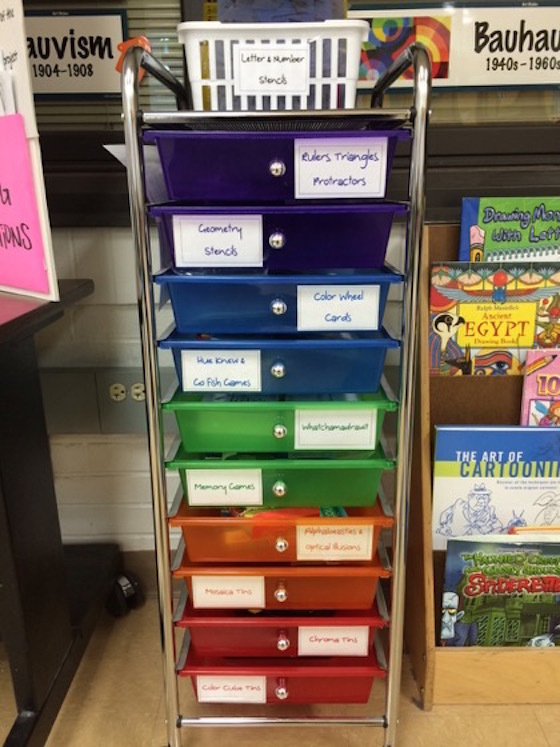 Develop systems of sorting. Whether you sort by color, artist, or in another visually pleasing way, have a system that YOU can stick to. I love browsing Pinterest for sorting ideas! 3. Recycled containers are your friend. Both my materials shelf and paintbrush system are created entirely of free, recycled containers which are spruced up with printed labels or paint. I keep extras organized in my closet for easy grabbing! 4. Invest in plastic bins of every size. Seriously, these come in handy for everything. 5. Add wheels for easy movement. I love having a cart of supplies that I can push out of the way when it’s not needed. Why not add wheels to all kinds of things? 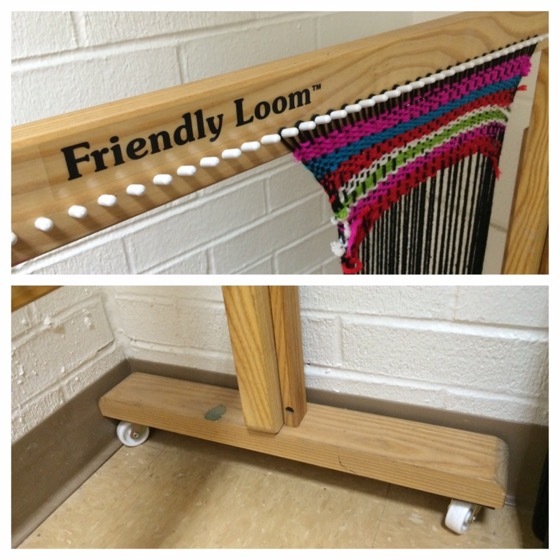 I added wheels, for less than $10, to my Friendly Loom for easy movement and storage. 6. 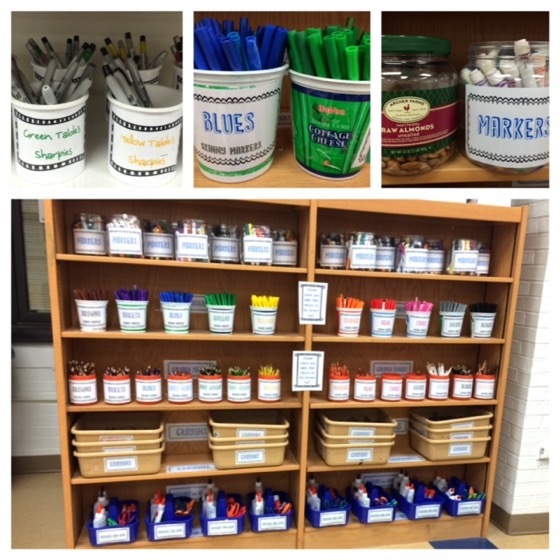 Organize your class shelves. Nothing is worse than lost student artwork. 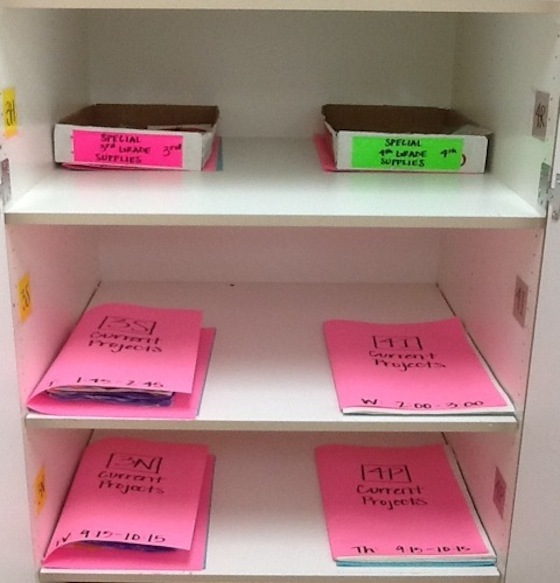 Get ideas for organizing student work and essential supplies with this video and article. Anyone in your room will know exactly where to find items, and more importantly, where to return them. Labels can also be helpful if you have deep shelves! Store everything from rulers and stencils to games and puzzles. 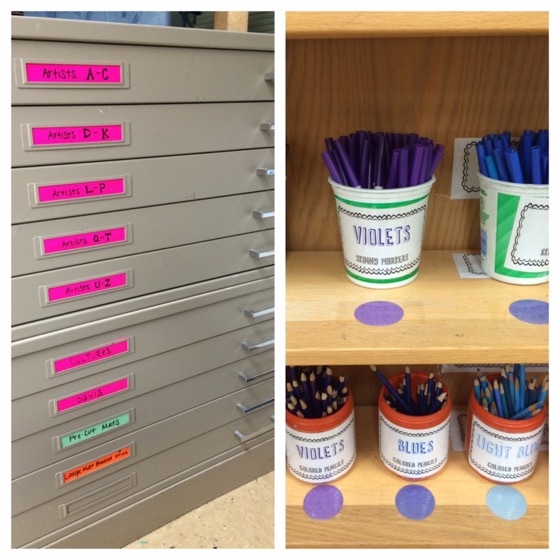 I’ve even seen educators use these drawers as individual project trays for choice-based projects! Store your digital files so you can access them anywhere. 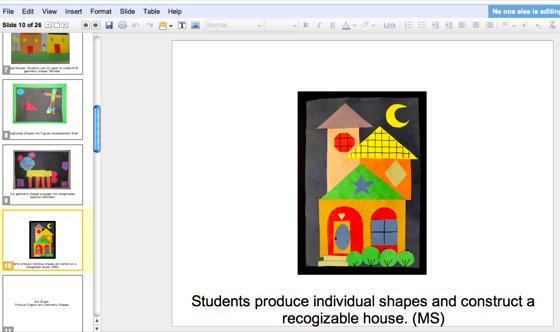 Check out this article for using Google Drive in the art room. 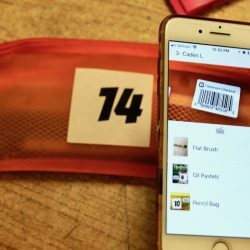 Scan any paper copies of items that you could store digitally. If you need to keep paper copies of things, take time to organize them. 10. Keep some empty surfaces and allow for growth in storage. 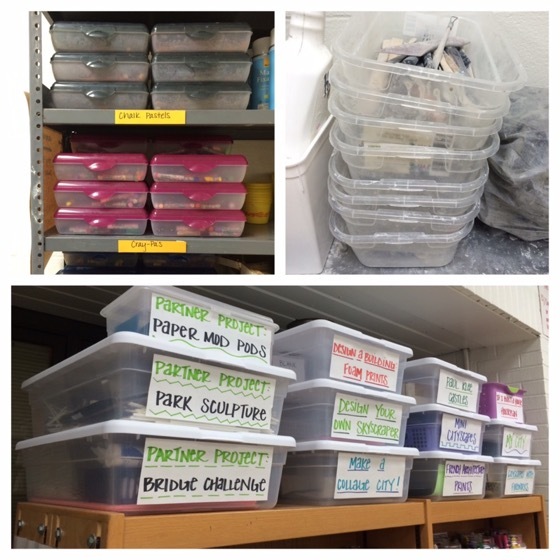 Make sure you have adequate space to spread out, to store 3-D projects or even that awesome donation of supplies! Check out even more storage hacks with these great articles about storing small supplies, passing out supplies, and using something as simple as binder clips to bring you peace of mind! How do you find the time to stay organized? What are your favorite storage hacks? 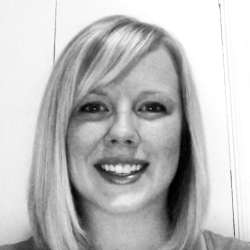 Alecia is an elementary art teacher in central Iowa who is passionate about teaching and reaching her students with an innovative and meaningful arts education. I take the heavy cardboard crates that grocery stores (or Costco) use for shipping strawberries… an are happy to give away! They lock together when they stack without crushing the boxes below and are ventilated to allow clay pieces to dry. I label each crate and can stack a lot of them in a fairly small footprint. And if they get too messy, I recycle them! Heidi, that is genius! Thanks for sharing! I use those also, but get them from my school kitchen. When some start to wear out or get too dirty (clay or glaze), I just ask the kitchen to save me a few more. They also work well for storing some bulky 2D projects or small weavings when the regular space for that class is too small (or full). One thing I do to help me stay organized is spending little minutes in my storage closet putting stuff away–not waiting for a day off with a huge chunk of time or the end of the year and having to stay two weeks after school’s out–but take five minutes here, fifteen minutes there and organize something or put something away. It really helps. 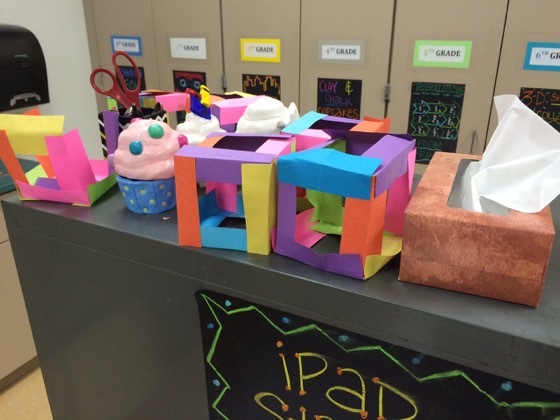 I’m more interested in that construction paper cube project! Do you just make cubes or do you do something further with that? What is the basis of the assignment/unit? Hey! I got the idea from the Davis Art curriculum books, but here’s a link I found! http://kidsactivitiesblog.com/62002/kids-craft-paper-boxes – It was part of my architecture unit for 3rd grade. Hope that helps!